I love using fresh herbs! Basil is probably my favourites and if I had enough on hand, I would probably use it every day :-) So since the plant I have in the kitchen was growing pretty quickly, I decided to make this pasta dish and it turned out pretty nicely. - Boil the pasta according to the package instructions. Drain, but don't rinse. 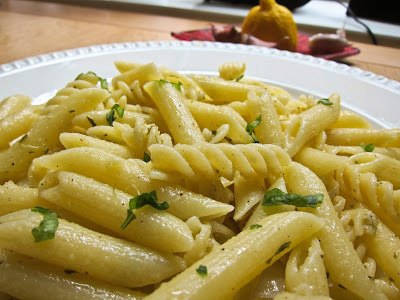 - Put the pasta back in the pot and add the rest of the ingredients except the cheese and a few basil leaves. Give it a good toss. - Add the cheese, taste for seasoning and adjust. Sprinkle the few basil leaves on top, give it a gentle toss and enjoy!